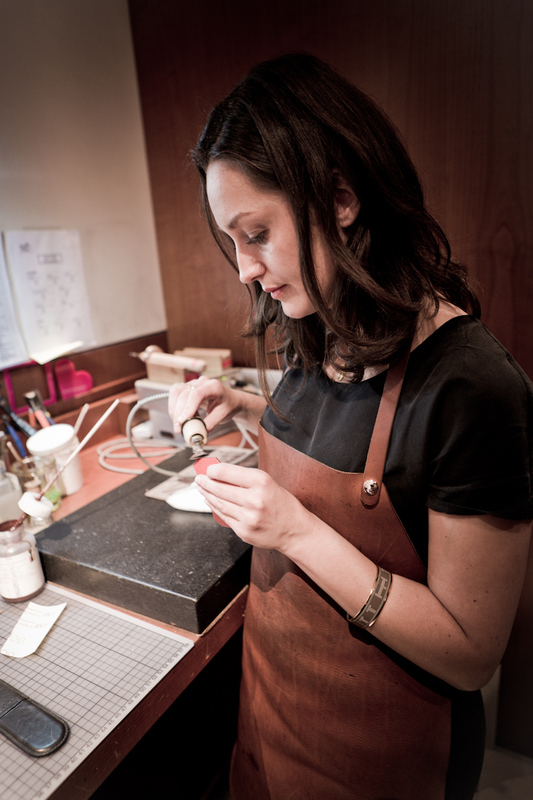 Claire Marie is the artisan in the Bond Street branch of Hermès. 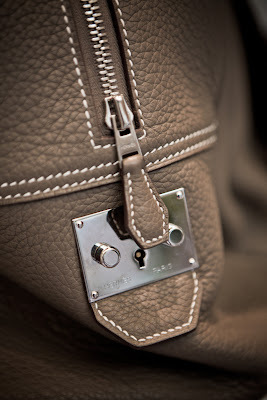 It is her job to make alterations and repairs to client’s belts, bags and other leather accessories. As reported in a previous post in this series, she is also a proficient bag maker herself. Permanent Style quizzes her on the Hermès training and why she enjoys working in the London store after her Paris workshop experience. How long have you been at Hermès? Five and a half years. Before that I was studying bookbinding and book restoration in Paris. I designed book covers for limited editions as well, creating mosaics on leather for example. Do you miss working with books? I do a little, yes. I’ve thought about suggesting that Hermès starts making leather book bindings. But this is also a reason I like working as an artisan here in London – it means I get to see old Hermès products rather than just make new ones. You see different models, many of which aren’t produced any more, and take them apart slowly, examining the construction. In that way it’s similar to book restoration. Do any particular bags stick in your mind? Yes, there was one bag recently brought in that belonged to the Charlie Chaplin family. A small handbag from the 1930s, it needed a few stitches repairing and a general refurb and repolish, but it was in very good condition. Why did you decide to come and work for Hermès? While I was studying I met a guy who used to be a saddle maker there. He gave me the idea, and it appealed because Hermès is the best company to work for as a leather worker, as well as a great preserver of arts and crafts. It was 13 months in a school in Paris. 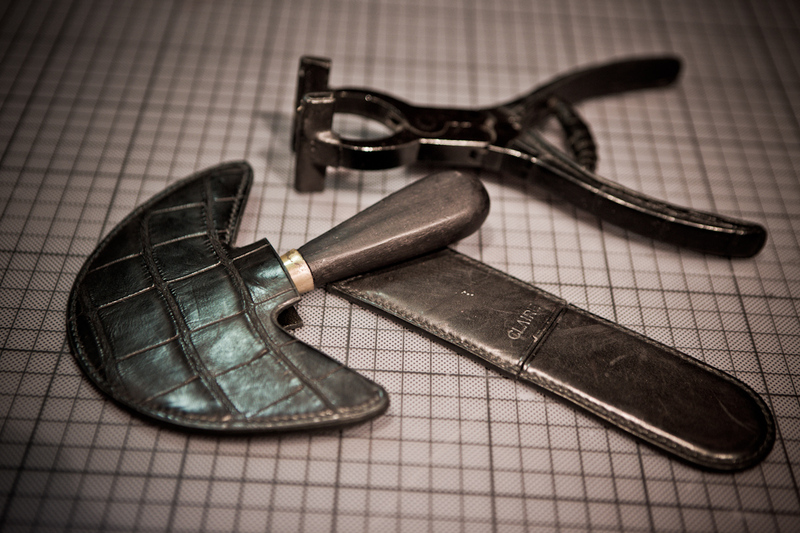 The training can be longer, up to 18 months, depending on your experience, but everyone needs to have a qualification in working with leather already. At the time there were around 30 people in the school with me; now they have smaller classes. The teachers are known as ‘godfathers’ and we had around four students to each godfather. Absolutely. In the first week you do nothing but learn how to manipulate and look after your tools. Then you work on maintaining a good posture when working, before you begin saddle stitching long lines in leather. They deliberately make you start with the most difficult leather – box calf, which is very hard and scratches easily. But it’s the best school to achieve the level of expectation we aim at in this House, no other one gives so much attention to details. When do you move on to making bags? When you’re confident working straight lines, you begin trying to make a Kelly handle. Again, it’s deliberately the hardest thing to do, with at least five layers of leather in the middle. You can easily spend two or three months just getting that process right. The next stage is making a full Kelly that is stitched on the outside – some are stitched inside and have to turned inside out once they have been made. What is most difficult about making these bags? Part of it is simple organisation. There are so many parts to the bag, that have to be put together in exactly the right way and the right balance for the whole to work perfectly. That first bag can take you 50 or 60 hours to make. Then you move on to different bags and different leathers. Did you move around in Paris once you had finished training? Yes. The first year I specialised in men’s bags and travel bags. Then later I moved to a different workshop that did men’s bags and clutches, such as the Constance or Kelly clutch. One particular highlight was being part of the four-person team that made the first Kelly flat. Designed by Jean-Paul Gaultier, it was a version of the Kelly in very smooth leather that flattened out and could be worn as a clutch. And then you applied to move to London? Yes, I liked the idea of working with older, vintage models and dealing more directly with customers. There are about 15 people working as expats in this way, outside France and I think it’s a great service. 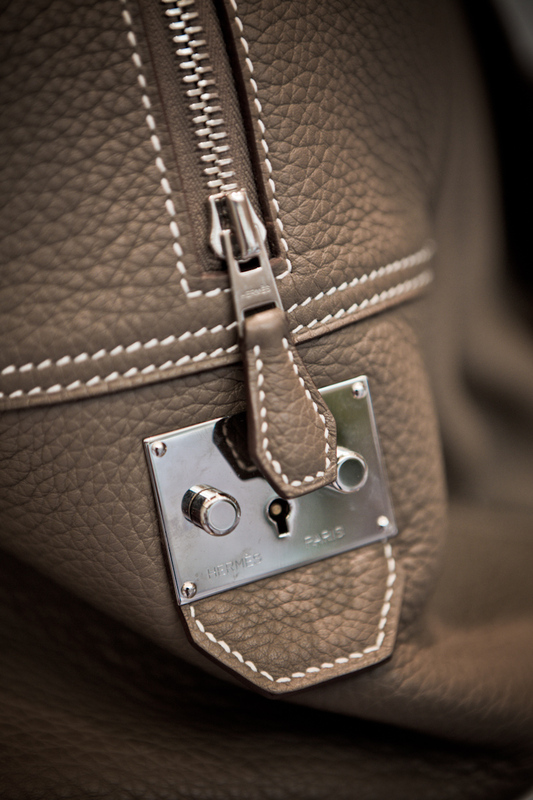 I particularly like stamping initials on iconic bags – it’s a rather emotional experience, producing something that will become part of a family story. You can follow the discussion on Hermes: Interiew, Claire Marie by entering your email address in the box below. You will then receive an email every time a new comment is added. These will also contain a link to a page where you can stop the alerts, and remove all of your related data from the site. I don’t know Smythson or Launer as well, but I sincerely doubt they hand paint and wax all their edges. And I know they don’t hand sew them. So no, I don’t think they are on the same level for leather goods. A better English equivalent would be the Alfred Dunhill factory in Walthamstow, or some Tanner Krolle and Swaine Adeney. I don’t know the details of the Hermes business enough to comment on whether they are overpriced. I just found this blog! i love it! Best regards from Spain! hello i am a saddler maker and leather crafter i would love to work for hermes but i can not find a way of applying to them, i woulkd be very interested in going to their tranning school? can any one help me ! You need to contact Hermes directly for source information on the procedures for training, they have a few colleges they support, but do not give initial training in house. You need to qualify at one of the colleges before being considered for a series of in-house training at Hermes, and of course they choose the best students. A good grasp of the French language is required. There is an interesting section in the Hermes ‘Hearts and Crafts’ movie where they interview new students in training. Good luck! I would love to know where she did her schooling in Paris for those 13 months? Thanks! I trained at Cordwainers Technical College in London and was awarded membership of the Society of Designers-Craftsmen. I never heard of this, but I did go to the Hermes expo in 2012. I would love to do the Hermes course. I do speak French well. Carole in Sydney, australia.